The Strong and National Museum of Play have announced the 2015 class of inductees to the National Toy Hall of Fame. Sharing the honor with puppets and the Super Soaker is the game, Twister. 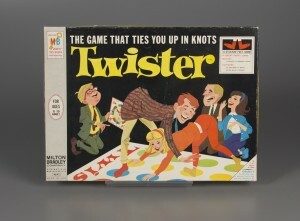 The invention of Twister dates back to 1964 but by 1966 Milton Bradley had already given up and called off further production of the game, which some considered too racy. Then in an appearance on the Tonight Show, Twister was played by Johnny Carson and Eva Gabor. In 1967, it sold more than 3 million copies.